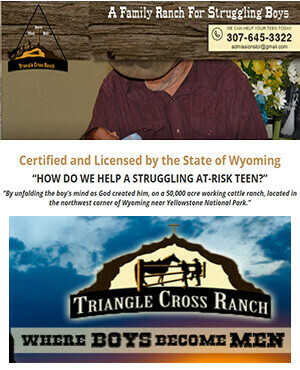 Triangle Cross Family Ranch also offers a variety of recreational activities in the great outdoors of Wyoming. We are avid hunters and view the sport as a means to teach your child self-reliance in wilderness settings, ethical cultivation of game animals, how to butcher and process game meat, and firearm safety. Some of the activities we offer through our Big Sand Coulee Outdoorsman Program include back country elk hunting, trapping, fly-fishing, deer, bear, small game, and bird hunting. We can also arrange a guided hunt for you and your son which we offer as a complimentary service! Outdoorsman Program Elk Hunts: Known as the greatest challenge of the high country, elk are elusive animals and require the sportsman to venture deep into remote wilderness areas of the Rocky Mountains in order to hunt this treasured creature. Should your son accompany us on this backcountry expedition, he will have already developed intermediate horsemanship skills and will benefit by learning how to saddle, lead, and care for a string of pack horses in a wilderness environment. He will also learn “Leave No Trace” camping practices and “Bear Country” safety and awareness. Trapping: We run and maintain a 5-mile trap-line on our ranch throughout the fall and winter months, which gives our boys a consistent opportunity to hone their horsemanship skills, and have some excitement while they contribute to protecting our livestock by harvesting predatory animals. Some of the animals we trap and sell to a fur trading company are coyotes, bobcats, foxes, and badgers. Fishing: Whether we take a boat or an ice shanty out on the Buffalo Bill Reservoir, or cast our lines from the banks of the Yellowstone River, the boys at Triangle Cross Family Ranch take full advantage of living in an area renowned for its fishing. We teach the boys how to tie their own flies, how to fly-fish, and also how to fish for carp using a harpoon rigging on a bow and arrow. Father/Son Hunts: Triangle Cross Family Ranch offers optional hunting trips for you and your son at no additional cost. We strongly recommend that you take advantage of this unique opportunity to deepen the relationship you have with your son while enjoying the beauty and grandeur of the Rocky Mountains in northwest Wyoming.